(a) Calculate the velocity with which the electrons strike the fluorescent screen, assuming that the space between the accelerating anode and the fluorescent screen is devoid of electric fields and the electrons start from the cathode with negligible speed. (c) If the cathode ray tube is rotated through 90º in the opposite direction, will the direction of deflection of the spot of light on the screen change? Justify your answer. (d) Derive an expression for the specific charge (charge to mass ratio) of the electron in terms of the given data and the shift s of the electron spot on the screen, on rotating the cathode ray tube through 90º. Assume that the shift s is small compared to the distance between the accelerating anode and the fluorescent screen. 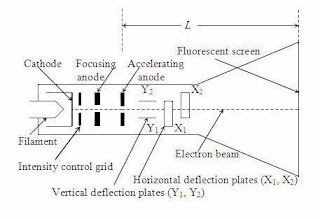 This is the velocity with which the electrons strike the fluorescent screen since their velocity after leaving the aperture of the accelerating anode remains unchanged in the field free space between the anode and the screen. Earth’s magnetic field is directed from south to north. Electrons traveling from east to west make a conventional current flowing from west to east (since the electrons are negatively charged). Therefore, in order to apply Fleming’s left hand rule for fining the direction of the magnetic force on the electron beam, we have to hold the forefinger along the south to north direction and the middle finger along the west to east direction. The thumb will then point upwards. (c) If the cathode ray tube is rotated through 90º in the opposite direction, the electron beam will be deflected downwards since the electrons travel from west to east. F =evBh sinθ where θ is the angle between the magnetic field and the direction of the conventional current. Since θ = 180º, F = 0. Since the deflection (s) produced is small (Fig. ), we may assume that this force acts vertically throughout the path of the electrons.